Bring the Best to Your Game Table! The sheer volume of d20 System products - especially those with small print runs and low profiles - makes it impossible for a player to find out about them all, let alone read them all. That's why this collection of The Year's Best d20 game material is vital if you want the best of what the industry has to offer. 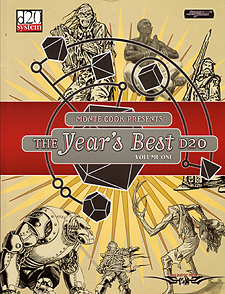 Compiled and introduced by 3rd Edition codesigner Monte Cook, The Year's Best d20 presents a unique collection of classes, feats, magic, monsters, and variant rules that illustrates the d20 System's flexibility. The contents, drawn from a thorough examination of products released in 2004, represents a variety of authors and publishers. The invaluable reference is a treasure trove of material suitable for any campaign. If you buy only one game product this year, make sure it's the best.